Explosion during mass targeted worshippers near St Mark's Cathedral, the main Coptic church in central Cairo. A bomb blast has killed at least 25 people during Sunday mass inside a Cairo church near the main Coptic Christian cathedral, according to Egyptian state TV . 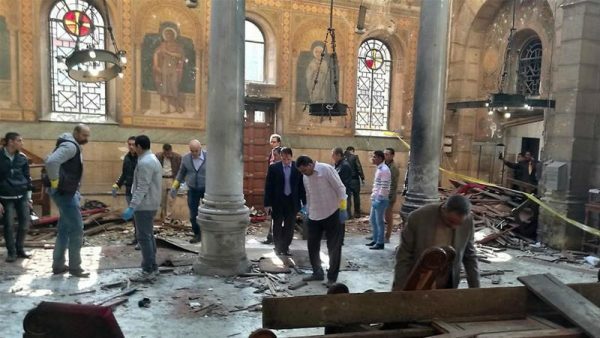 The explosion ripped through St Peter’s Church at around 10:00am local time, wounding at least another 35 people, according to Egyptian security officials. St Peter’s Church is beside St Mark’s Cathedral, which is the seat of Egypt’s Orthodox Christian church and is home to the office of its spiritual leader, Pope Tawadros II. Services were being held in St Peter’s on Sunday morning, while St Mark’s Cathedral was being renovated. A state-run news agency reported that a bomb was lobbed inside the church, though AP news agency cited witnesses saying the bomb was planted inside the building itself. “I found bodies, many of them women, lying on the pews. It was a horrible scene,” cathedral worker Attiya Mahrous, who rushed to the chapel after he heard the blast, told AP. His clothes and hands were stained with blood and his hair matted with dust.